DC leads the comic industry in terms of characters who functionally duplicate other characters. Superman's great, but Martian Manhunter, Shazam, Mon-El and Captain Atom can all do the same things he can. There are three different Flashes, a Kid Flash, an Impulse and at least four other speedsters, one of whom is the daughter of another. Batman has an entire international team of copycats, not to mention all the ones he's trained himself. Elongated Man is a knockoff of Plastic Man, Zauriel is Christian Hawkman, and if 7200 Green Lanterns weren't enough, there are now six other color-coded Corps flying around the cosmos. Even J'onn J'onzz gets a second-rate copy, in the form of Jemm, Son of Saturn. 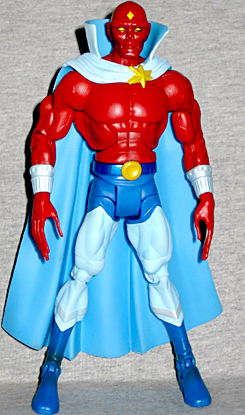 Red-skinned Jemm, whose forehead gem prophesied that he would be the planet's savior, found himself exiled during the civil war between red-skinned and white-skinned Saturnians. He voyaged to Earth and had the misfortune to fall into the hands of criminal mastermind Lex Luthor, who was later defeated by the Justice League. Severely traumatized by the experience, Jemm was nursed back to health by Martian Manhunter. Eventually, with the Manhunter's aid, Jemm ended the bloody civil war on Saturn. Jemm was created in the early '80s, at a point when Martian Manhunter had been in comicbook limbo for a while. Greg Potter and Gene Colan envisioned him as J'emm, Son of Mars, and he would have been J'onn's cousin. Then they learned that J'onn was soon to return, so the character was changed from green to red, his planet was changed from red Mars to yellow Saturn and he was almost immediately forgotten. Success! The amount of newly sculpted pieces that Jemm gets is truly, truly, truly outrageous. The center mass - torso, hips, upper arms and legs - I'm pretty sure we've seen before, but the shins, forearms and hands are new. He has very long, slender fingers, which are definitely inhuman - there's really nice sculpting in the wrinkles at his knuckles, too. His wristbands are sculpted elements, not just painted, and the shins are longer than usual, to give him an unearthly height boost (he stands an even 7" tall). They also appear to be pants falling over boots, which is something you never see on superheroes. Jemm's head is clearly derivative of Martian Manhunter's - he has the same sunken cheeks, the same bald pate and the same prominent brow. The differences include the jewel on his forehead (of course) and the fact that he has pointy ears instead of rounded. Wow, what a change! At least the red chosen for his skintone is dark enough that he doesn't look plasticky. Despite all the new bodyparts, there are no new joints. That's fine, we're used to Mattel's mundane articulation. However, it must be noted that the waist joint doesn't get along with the big round belt buckle. 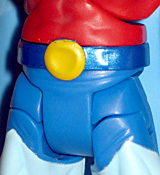 The buckle sticks up above the joint, so if you turn his torso, it gets pushed out of place and folds over. Whoops! Oh well, at least the new cape doesn't mess with the torso hinge at all. Detail's a bit soft, though - the star-shaped clasp could be crisper. Like Sinestro Corps Batman, Jemm gets a DC 75th Anniversary collector's button that is basically a boring piece of clip art with a vaguely appropriate image dropped in behind it. The background is probably supposed to be Saturn (it's a planet with a ring), but it's red-orange instead of the yellow it should be. Artistic license or science-fail? Jemm's part of the BAF Validus is the left arm. Though this arm is based on the same underlying sculpt as Brimstone, Kilowog and Arkillo's arm, it's a new mold: he only has three fingers, there's a band on his bicep and a cable connecting it to his shoulder. It certainly beats a straight repaint, that's for sure! Since the character he was intended to replace came back, Jemm faded into obscurity pretty quickly. His own series lasted only a year, and his next major appearance was in 1997's JLA "Rock of Ages" story, which was one of the best things Grant Morison ever did with the JLA, but even then Jemm's role was minor. It's really strange that Mattel chose to make a figure of such a forgettable character, and even stranger that he'd be in the same series as J'onn, but the toy itself is solid work.